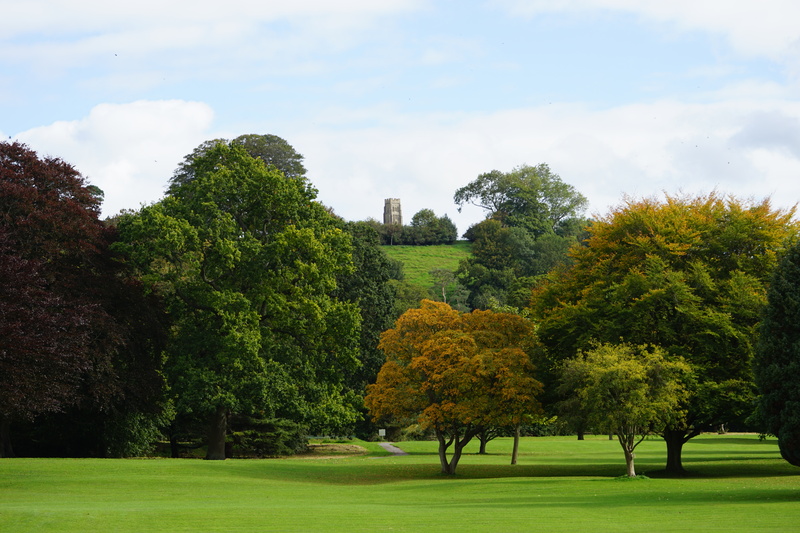 From Devon we headed to another one of my ‘must see’ destinations, the exquisitely unique township of Glastonbury. Excitement levels were high, and when I first spotted the famous Glastonbury Tor in the distance I may have let a small squeal of delight out. 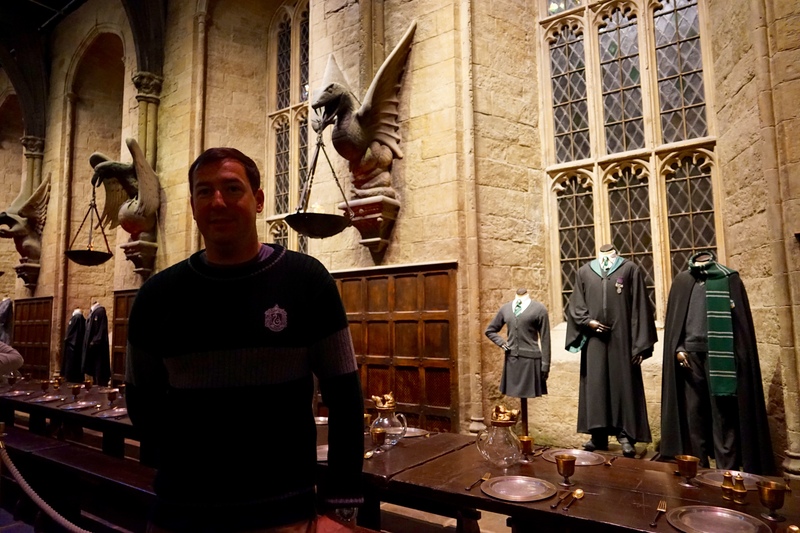 It was so much more impressive than I had imagined, and I have a pretty good imagination. 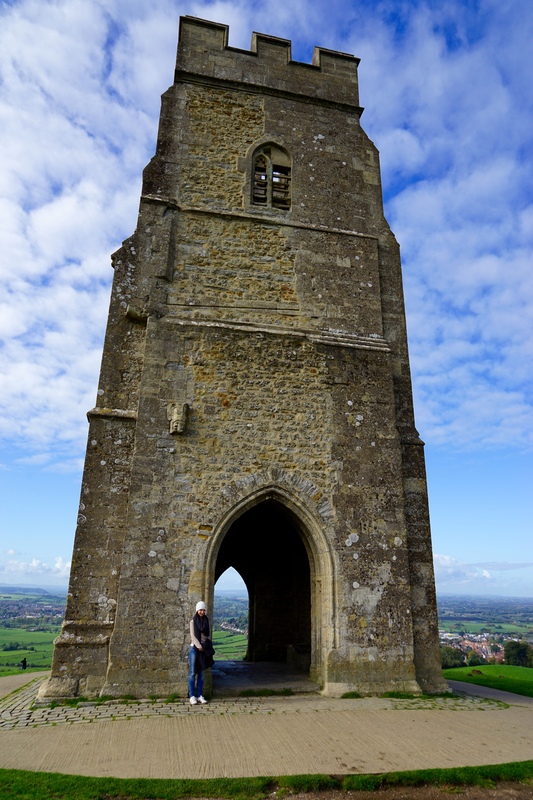 The only remaining structure on the Tor is the tower entryway to the old church, and I thought it beautiful. We were exceptionally lucky to have clear skies and warm weather for our ascent, and it is a steep climb no matter which direction you come from. But it is very much worth it. The view is incredible from the top, breathtaking (though more likely that is from the steep climb). To many, Liam included, it may seem like an old building on a hill, but for people with a bit more imagination and a love of myths and legends it could be the site of the famous Avalon. The National Trust even go as far to name it thus on their gateway! They even have an arrow vaguely pointing to the distance and the castle of Camelot. In very clear, definite terms. Not sure how they can get away with this, but it didn’t lessen my enjoyment of the site. 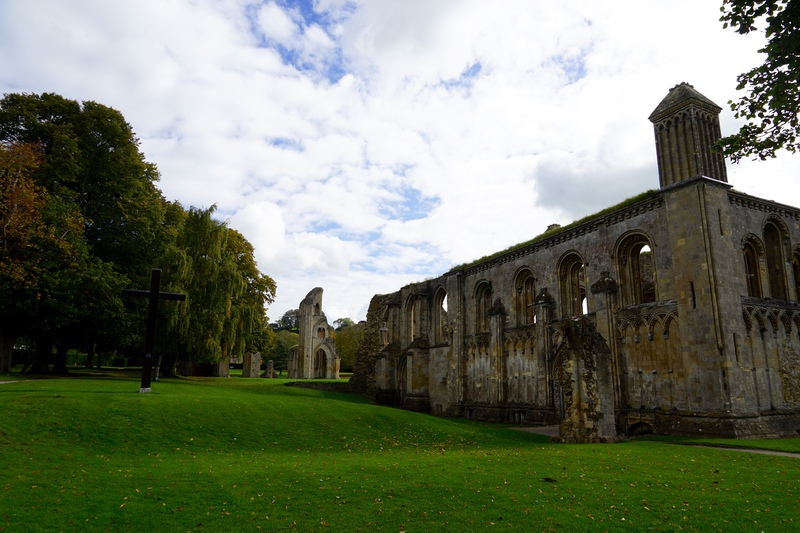 We next visited the ruins of Glastonbury Abbey, another architectural victim of Henry VIII’s dissolution of the monasteries. The remains hint at just how impressive the buildings would have been in their heyday. 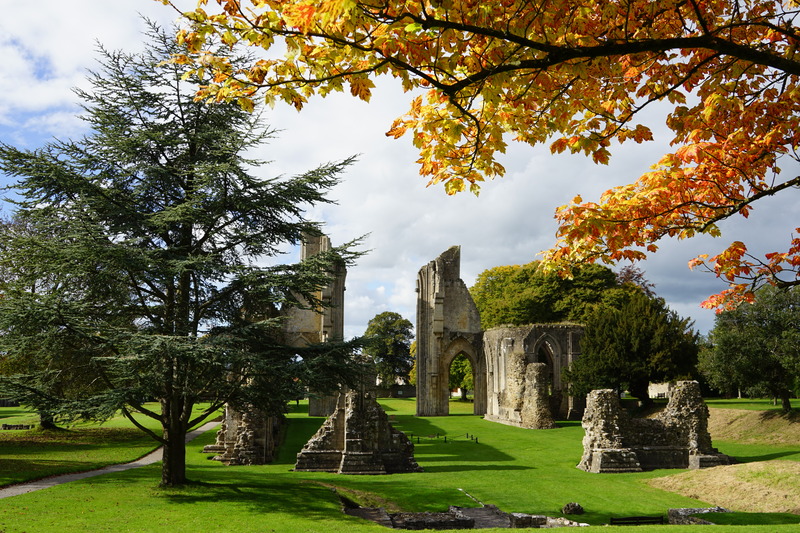 There was a time when the monks claimed to have found the famous King Arthur’s tomb, thus bringing in many pilgrims and donations. Coincidently this was at a time when the buildings needed drastic maintenance. What happy chance. After the Abbey we went for a walk around town, dodging Warlocks as we went (Glastonbury has a fairly unique vibe which really needs to be experienced) and stumbled into the excellent Burns the Bread bakery for a quick lunch before heading over to meet up with Linda Connors and her partner John. Linda is a Flanagan family friend from Tasmania and it was nice to be able to sit and chat with someone who comes form our neck of the woods. We had a great night with Linda & John who took us out for dinner (Belgian beers came out in preparation for our next adventure) before heading home and chatting late into the night. We probably should have gone to bed earlier so we were a bit more lively for our next destination, after a super smoothy and a few slices of vegemite on toast we set off for our next destination, Stonehenge. 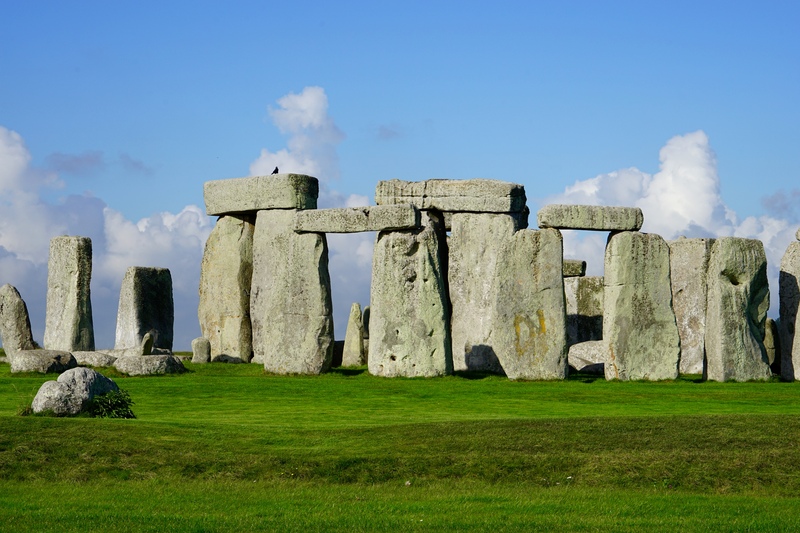 Below is the annoying parody song about Stonehenge that was sung incessantly by Liam for days on either side of our visit. 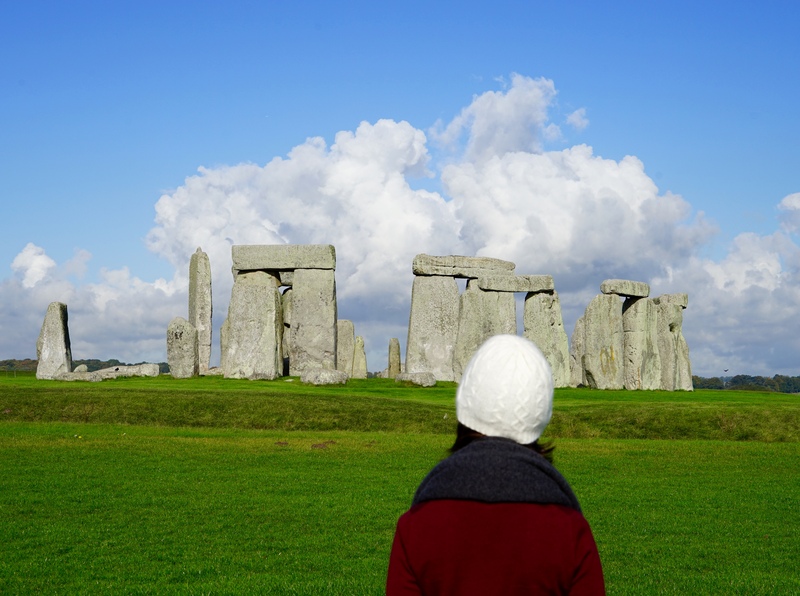 It is included only to capture our full Stonehenge experience, viewing is not mandatory. We arrived at Stonehenge at around 10:30, alas dozens of coaches had arrived in the previous hour and the site was swarming with tourists. Access to the interior of the stones is now restricted as the amount of foot traffic through there back in the day was causing the stones to shift. 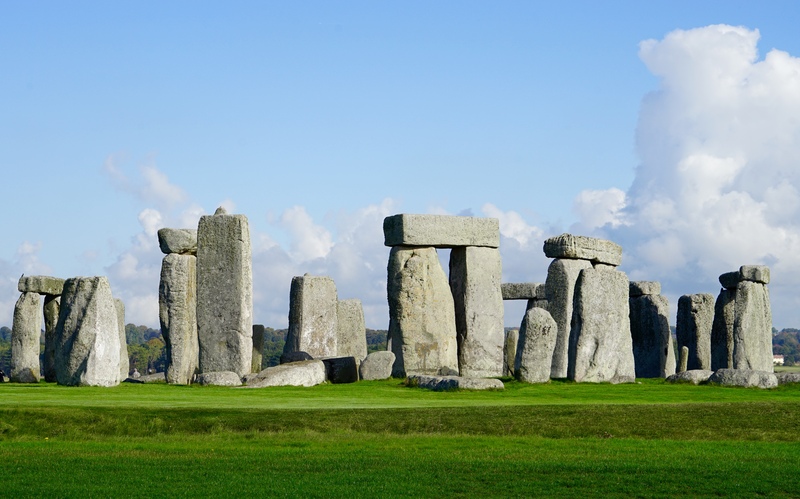 The site is now enjoyed by walking around the outside of the henge in a big circle on a marked path whilst listening to an audioguide. Whilst completing our circuit we perfected the art of patiently waiting until all of the tourists walking around the opposite side were perfectly aligned with the pillars so it looks like their aren’t 10,000 people there, check out some of our best efforts below! It was a majestic place but we have great regret that we weren’t organised enough to get booked into one of the sunset or sunrise tours that are conducted with limited numbers of people. Next time! 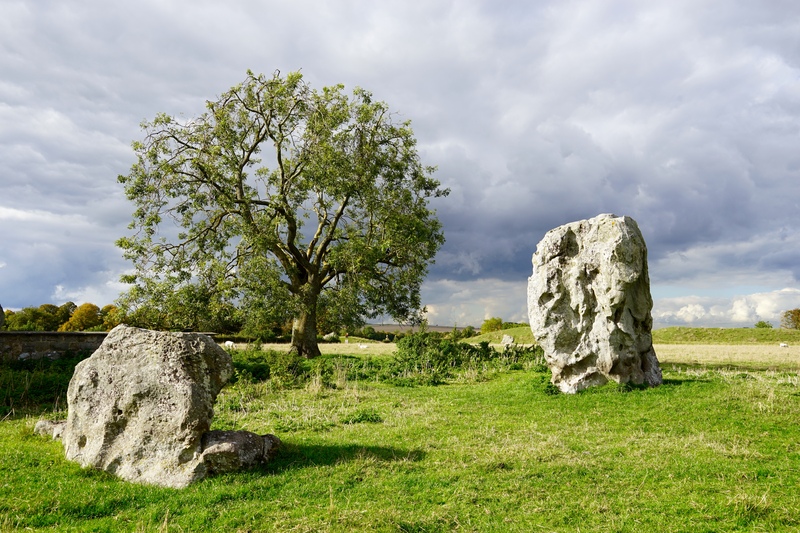 We next headed to Avebury to see the town built within a stone circle. As you do, it was the theme of the day after all. We had a cheap pub lunch and an enjoyable walk around the town afterwards. We had the pleasure of being swarmed by lady bugs, they were mostly attracted to Liam and at one stage he had over 30 bugs on his head, legs, arms, torso. Everywhere. We gingerly waddled along so we didn’t unwittingly hurt any and were greeted with many odd looks from passersby. Perhaps they were simply envious that they hadn’t become a desirable resting spot for the local bugs, or, we looked ridiculous. Definitely one of those. Our next couple of days were in and around far North London (Zone 6) where we stayed at in our first private room AirBnB. To this point we had only stayed in private apartments so to try and save a few (hundred) pounds we stayed with Raj and his live in housekeeper Onina. It was a great house and we were very well hosted and constantly fed which was an unexpected bonus, but I don’t think we will rush to go private room again, would prefer to have our own space. 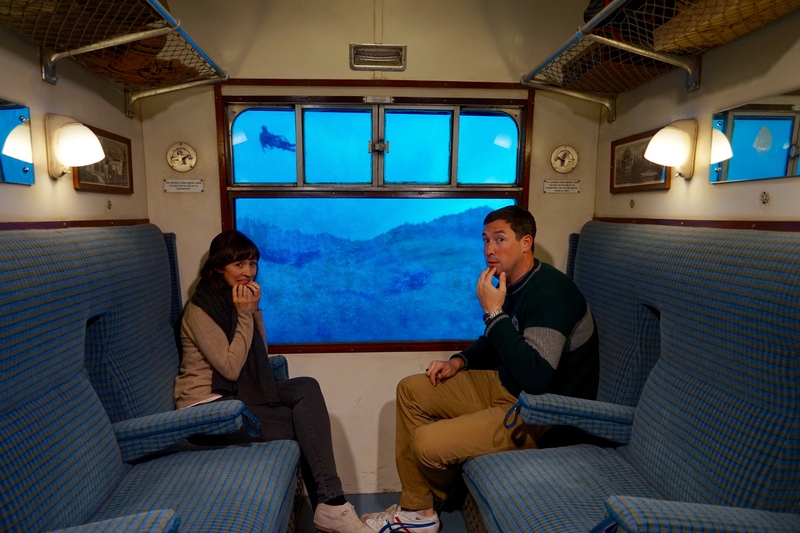 We did catch up on heaps of laundry which was way more exciting than in should have been, however that paled in comparison to the excitement of heading to Warner Brothers Studios for the Harry Potter tour. 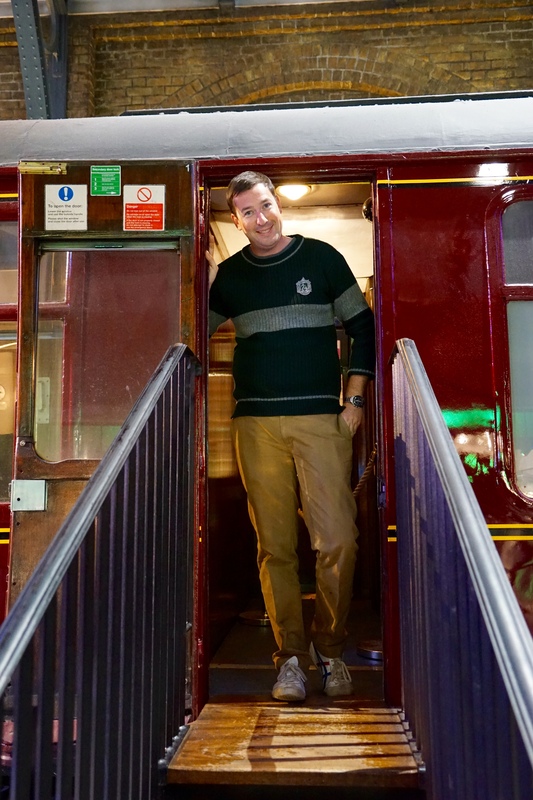 From there we headed onto the platform and jumped on the train, after surviving a run in with dementors mid journey we arrived at the mid way point of the tour where we found another gift shop and the cafe. 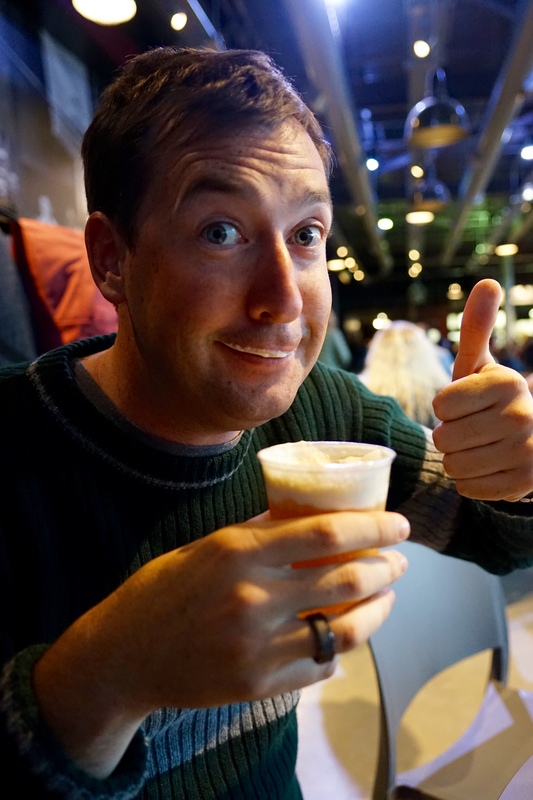 As well as picking up a packet of Bertie Bott’s Every Flavour Beans we ordered a frothy glass of Butterbeer, with this being one of only three places in the world in which it can be bought. The Butterbeer went down very well, especially the english toffee flavoured foam, the beans have been a bit more hit and miss with Liam refusing to touch them again after being hit by a soap flavoured jellybean followed by sausage. Apparently not an amazing combination. 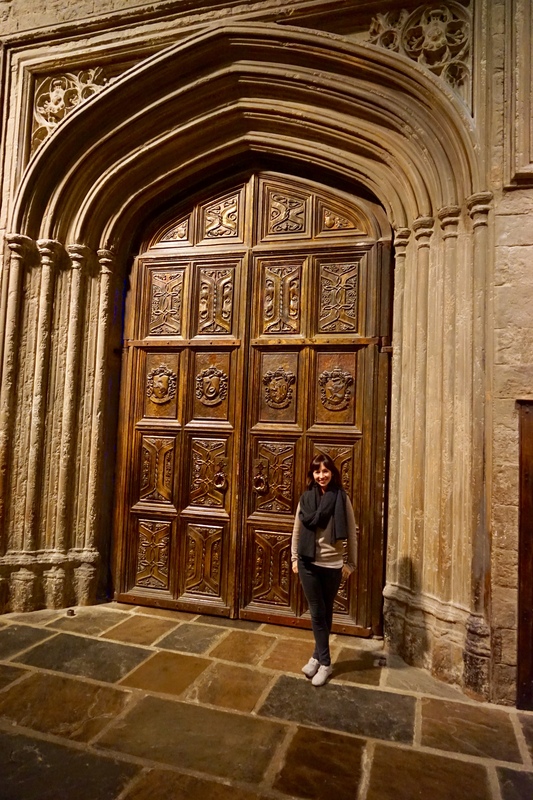 We also got to walk the largest of the sets which was Diagon Alley, the sheer scale of this set meant it was the most immersive, it was as if you were actually in the movie! 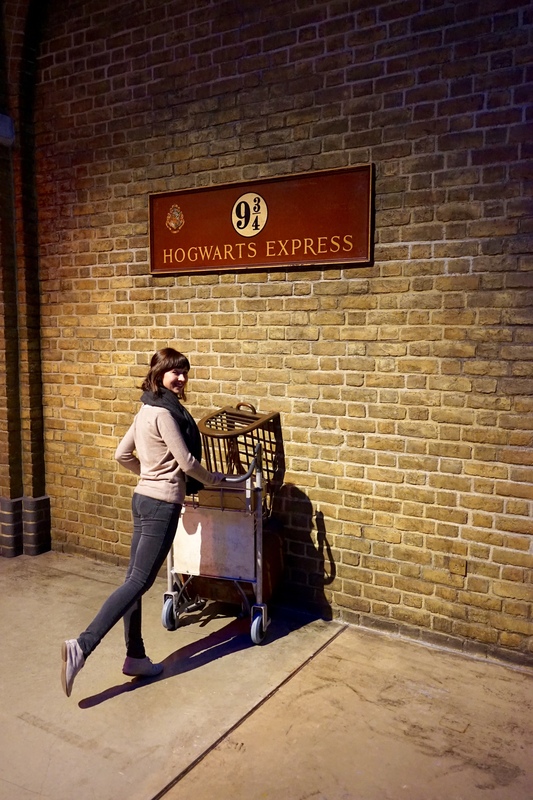 We spent a bit of time here soaking up the atmosphere and posing for photos before heading through to the next section of the tour to check out the sketches, plans, models and concept art that had been accumulated throughout the creative process of turning the well loved books into one of the richest movie franchises of all time. The tour finishes on a big surprise which shall not be named and after several very enjoyable hours we exited via the gif shop and headed home for a much needed rest. The next morning we left Raj and Onina after an interesting breakfast consisting of apple pie, apple salad and reheated carbonara and made our way to the famous Kent region. 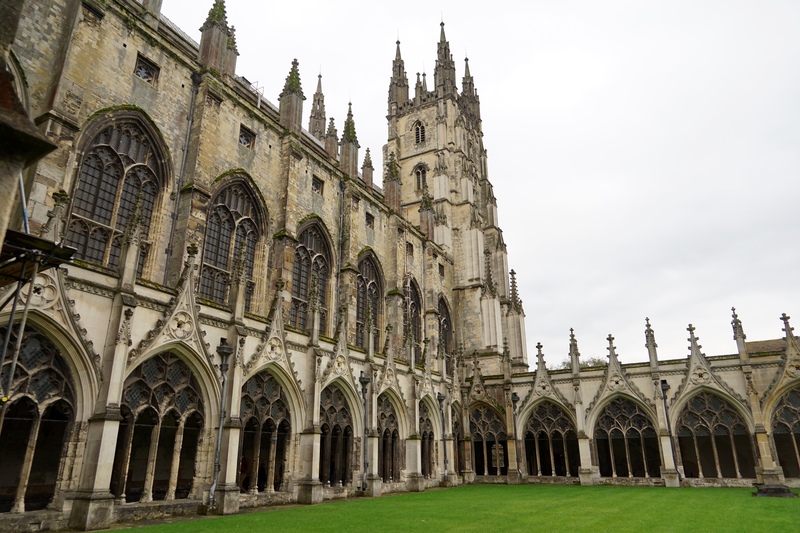 We stopped in at Canterbury for a bit of an explore before heading on to Chilham, our accommodation for the next two nights. 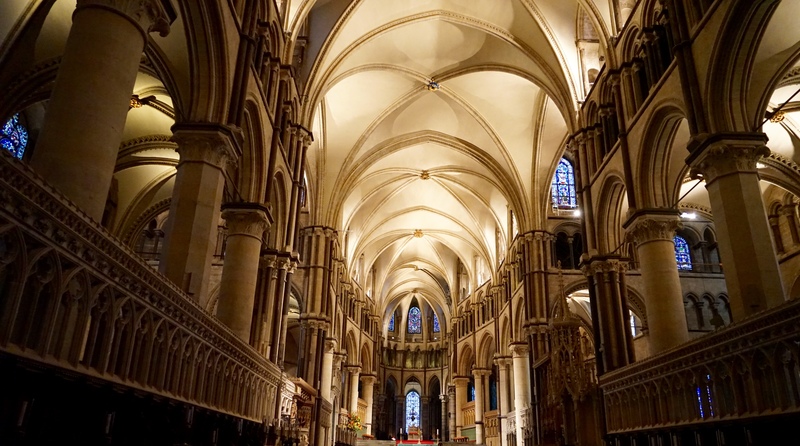 The Canterbury area has been populated for thousands of years, there are still Roman foundations under some of the houses, there is even a bookstore where you can go into the basement and see the remains of the underfloor heating system from the Roman baths. We had a quick look around the castle, built after William the Conqueror came through in the 11th Century. By happy chance we also came across a free museum with excellent exhibitions including a wildlife photography competition. We (Jess) were tempted by a canal ride (we’re tourists and not ashamed of it!) but the weather was threatening rain or blizzard and it was overly expensive. Perhaps another day. Moving on, Chilham is a quaint little Tudor town with well preserved buildings and funny locals. We grabbed dinner at the pub, where we were separated from the locals. We’re not sure if that was for our benefit or theirs. The weather is starting to get icy! We settled in to watch the Phantom on Netflix(excellent) and enjoy central heating. Our last day in the UK had arrived, we had successfully done our Schengen duty and stayed longer than we perhaps would have by choice. 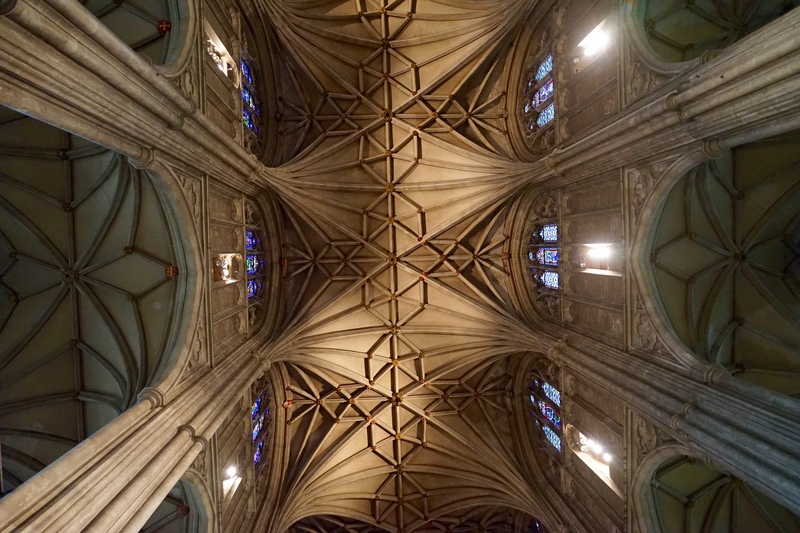 To celebrate this I had planned out a truly English day, our first stop was the magnificent Canterbury Cathedral. I took the time to sit in the nave and appreciate the intricate craftsmanship and read through the guide we had purchased. 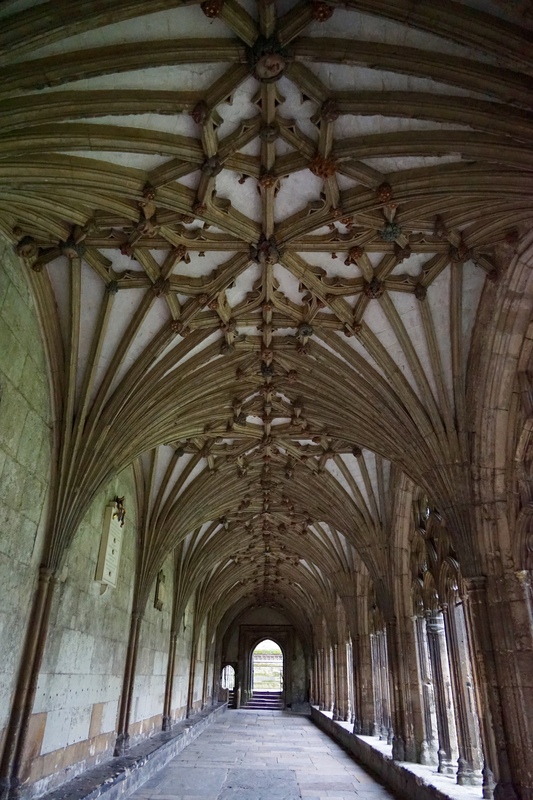 The interior grounds were my favourite part, showing how natural beauty enhanced the medieval architecture. Liam’s favourite part was when we left, two hours later. 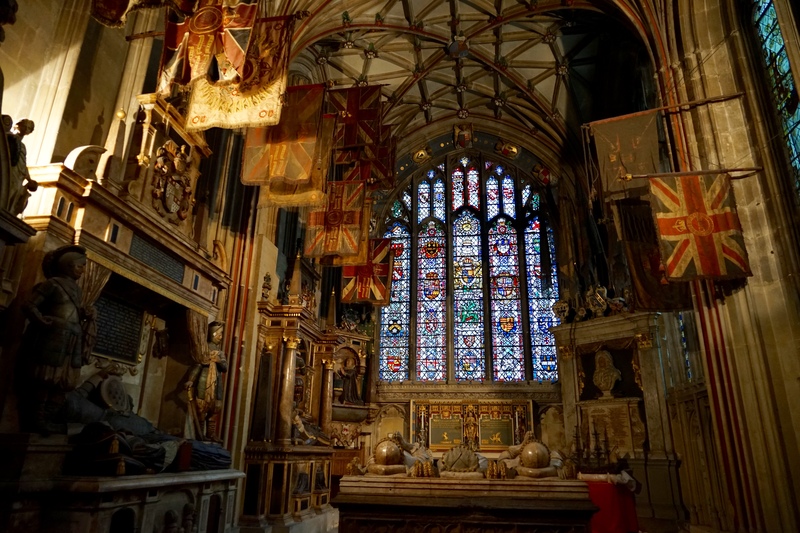 There was a roped off section where Thomas Beckett was murdered – within the cathedral no less – by four of King Henry II’s men. The Pope sainted him after some miracles which led to thousands of pilgrims making their way to the Abbey every year. Interesting (also unchecked) fact, the city guard would close the gates at dusk so people riding horses along the road late in the afternoon would be riding at a quick pace in order to reach safe haven by nightfall, this led to the rise of the term ‘canter.’ There you go. We headed for a nice lunch as a reward for Liam, and had a quick stop in at St Thomas’ hospice and halfway house for poor pilgrims. Great building, very much lacking in 90′ angles. 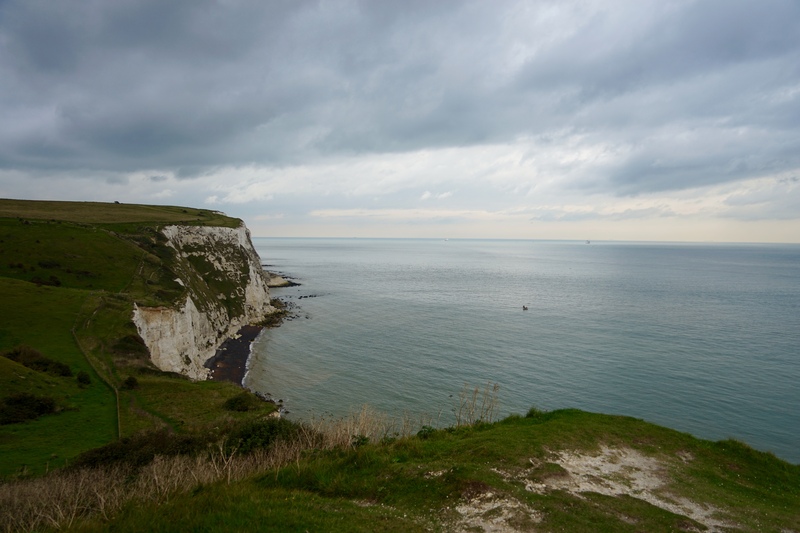 We left Canterbury for Dover and did the mandatory walk around the famous white cliffs. I say around but it was very much ‘on,’ and very near the edge. So dangerous! The cliffs are eroding and there’s no fencing. The paths were treacherous after some bad weather, but it was very much worth doing. 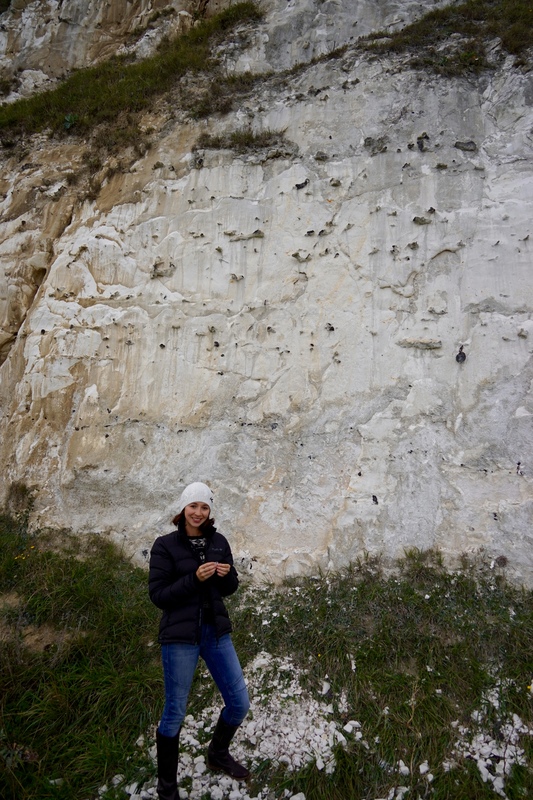 The white is from many tiny sea creatures 60 – 120 million years old. They’re very difficult to scrape off a boot. 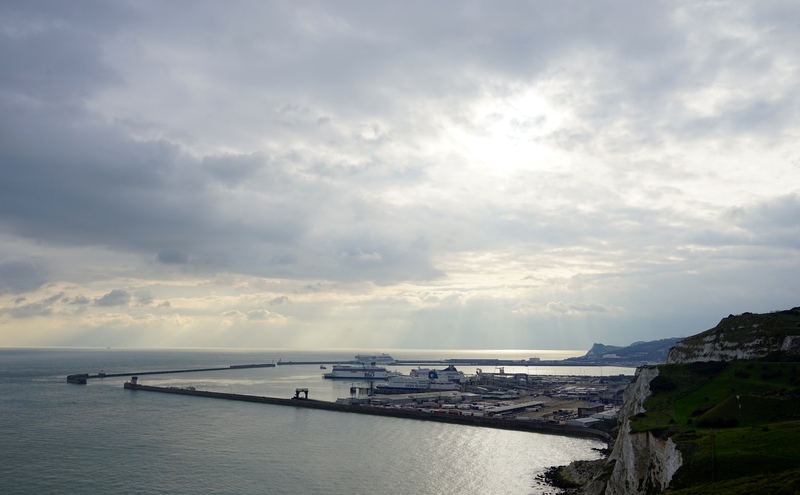 A good way to farewell England, which we did first thing the next morning by jumping on a ferry to France and making our way across one of the worlds busiest sea lanes. Thanks for reading, our next update shouldn’t be too far away and will be coming live from Belgium!! 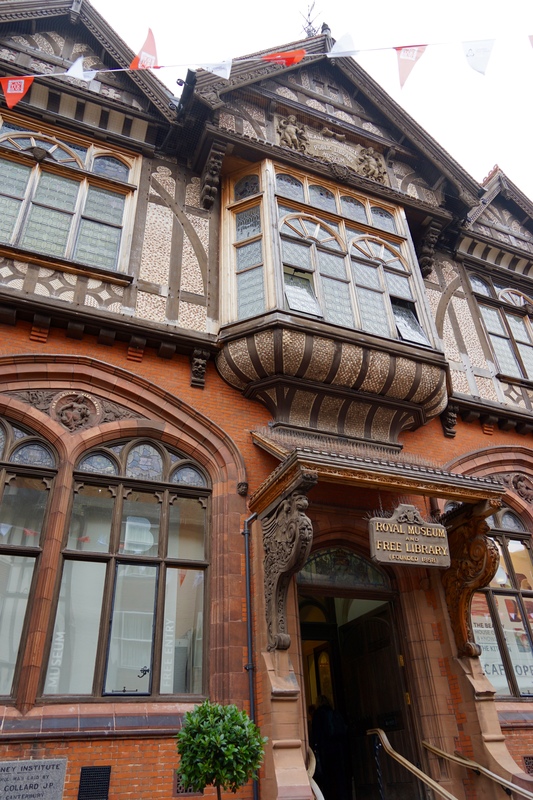 Love all those old buildings!